Sgt. John Howard of the OHSP, Portsmouth Post, was the guest speaker of the recent meeting of the United States Daughters of the War of 1812 Society, Scioto Valley Volunteers Chapter (SVV). Members expressed an interest in learning of the challenges of his work, and how the public can be supportive. In response, Howard spoke candidly of the primary issues faced daily by the Post Troopers, and the increasing risks associated with incidents involving illegal drug use. He provided a beneficial insight regarding the intricate law enforcement arena as it relates to local, state and federal agencies. Sgt. Howard’s passionate words reflected clearly his commitment to his job, his love for his community and his deep concern for the youth of our country. He is well known for his work with local teens stating he hears often the words “trying to find myself”, and he responds to them with, “make yourself.” He said he speaks to them regularly about day-to-day issues regarding bullying, the importance of education and finding their purpose in life. He encourages them to work hard to be the “best of whatever it is they choose to be.” Howard commented to the Chapter members that he personally relates well to their patriotism, love of God and family and that it is encouraging to him to see groups such as the SVV supporting the efforts of our local law enforcement. 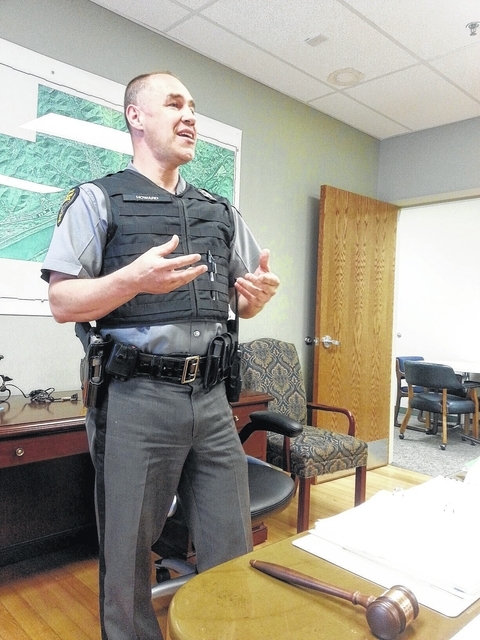 He lamented the constrictions of time, due to the highly demanding job responsibilities, that prohibits Troopers from being more involved in community activities. Sgt. Howard stated that it is the desire of the Troopers for the public to know the “person behind the uniform”. Following an opportunity for addressing questions by the members, Sgt. Howard received a standing round of applause at the close of his presentation. SVV President, Gail Swick, expressed appreciation on behalf of the Chapter, for Howard’s informative and very inspiring words.